Long scorned by collectors enamored of more glamorous marques, Esterbrooks have come into their own in recent years. 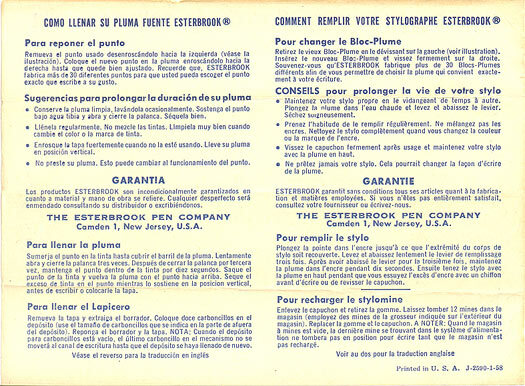 Made for the economy market and a favorite among students, Esterbrook pens (and the scarcer pencils) were consistently well-made and innovative. They are particularly appreciated among writers for their user-interchangeable Renew-Point nib units. Virtually all Esterbrook nibs are stainless steel, but gold nibs were used on the English Esterbrook Relief pens, as well as some extremely rare hard rubber eyedroppers. 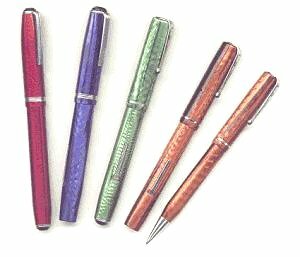 The group of pens above are all American-made models of the post-celluloid era. From left to right: a 1950s LJ (long slender model); a transitional pen c. 1944; c. 1940 pen with pierced clip; pen-pencil set with pierced clips, c. 1939. 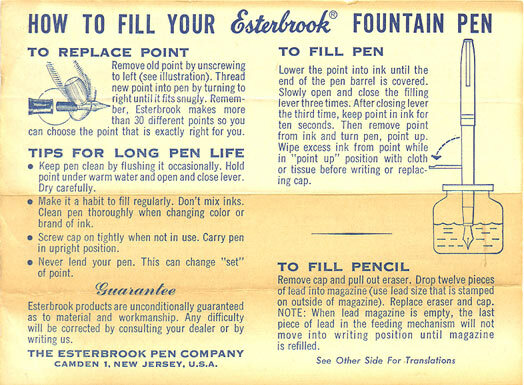 The "J" pen, introduced in 1948, is the classic postwar Esterbrook. Main variants are listed at right. In addition, there was the short-lived Deluxe series with a chrome slip-on cap, not to be confused with the less desirable later SM series, with a screw-on metal cap and ribbed ends. The company was renamed Venus-Esterbrook in a 1967 merger, and finally went out of business in 1971. Note that all but the very earliest Esterbrook nib units will fit all but the very earliest Esterbrook pens. About the only problem you may have in with the small purse pens, which sometimes have insufficient cap clearance for unusually long nib models (Falcons, for example). Venus and Esterbrook nib units are also interchangeable, as are most Osmiroid calligraphy pen nib units.